Ok, so you're wondering what this has to do with Dunnett - well these beautiful gardens are the site of the Nor Loch, where the attempt on Gelis' life is made while it is frozen over, and which Lymond unforgettably swims across at the beginning of Game of Kings on his way to meet Mungo's Pig! The Nor Loch was actually man made - which would probably surprise many Edinburgh folk, who, if they haven't read the history, probably assume it was natural and was later drained. It was created as an extra defence by James II using a natural spring situated at the base of the Castle Rock. Considering that the hollow where it was formed was carved out by glacial action it's perhaps surprising that it hadn't formed naturally, especially as the spring proved to be very plentiful and allowed the planners to change their ideas from a simple moat to a fully fledged loch, controlled by a dam and a sluicegate. The well and the tower which surrounded it are still there today. For a while the loch was an attractive feature which was much admired but it inevitably became overgrown and filled up with rubbish (and worse) from the city, until it eventually became a health hazard. It was reduced in size by drainage for the construction of the North Bridge and then divided in two by the Mound which was constructed (to connect the Old Town with the New Town which was built in 1767) from earth and rubbish produced when new streets were excavated in the town. Eventually it was drained completely and the gardens were gradually developed. 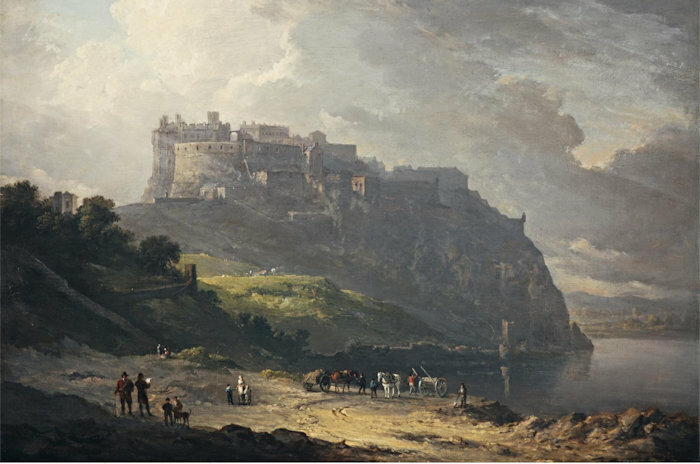 They have survived several ludicrous proposals for car parks and buildings, although they did succumb to the mania for railways when the original Edinburgh and Glasgow railway was pushed through close to the castle rock to terminate at Waverley Station. Thankfully a local law was passed which prevents any building construction on the south side of Princes Street which would of course destroy the finest city centre view in Europe. 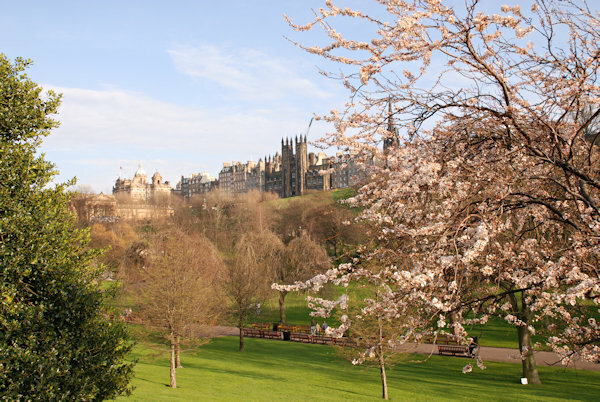 The Old Town of Edinburgh was based around a central spine that runs from the Castle down to Holyrood Palace. This is actually the glacial tail of a long-extinct volcano - the rock on which the castle stands was the central plug and when a glacier moved eastwards through the area that plug protected the ground behind it which became the slope down to where the palace and ruined abbey now stands. 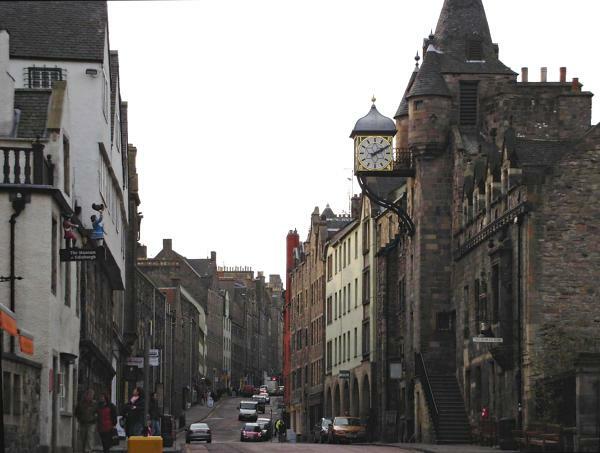 The road running down is known collectively as the Royal Mile. 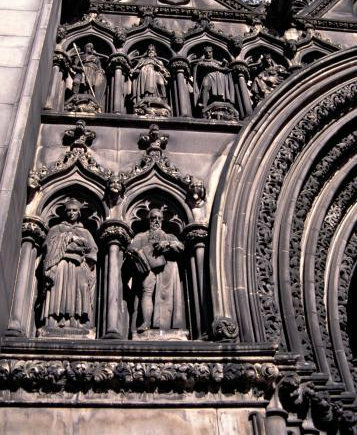 It is composed of three main streets - the Lawnmarket at the top, the High Street, and the Canongate which ran from the old city gate called the Netherbow down to Holyrood Abbey, and the name derives from canon's gait - monks walk. The slope is quite steep so the best way to see it is to start at the top and walk downhill. Perched high on its rock overlooking the city, the castle must be one of the most photographed buildings in the world. There has been a fortification on the site certainly as far back as Roman times and probably earlier. The oldest part of the castle still in evidence is the beautifully simple St. Margaret's Chapel which dates from the 12th century. 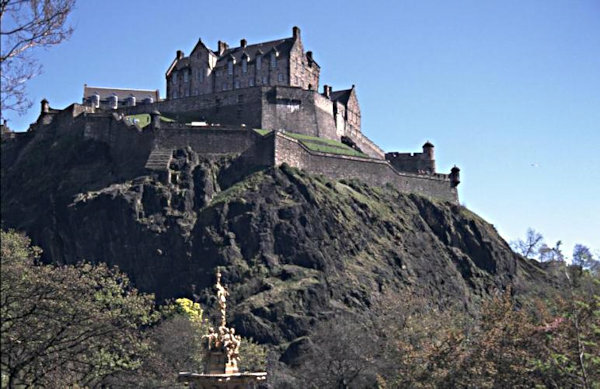 Amongst many 'must see' items are the Honours of Scotland - the Scottish Crown Jewels (the oldest in Europe) - and the famous old seige gun Mons Meg with four of its enormous stone cannonballs. 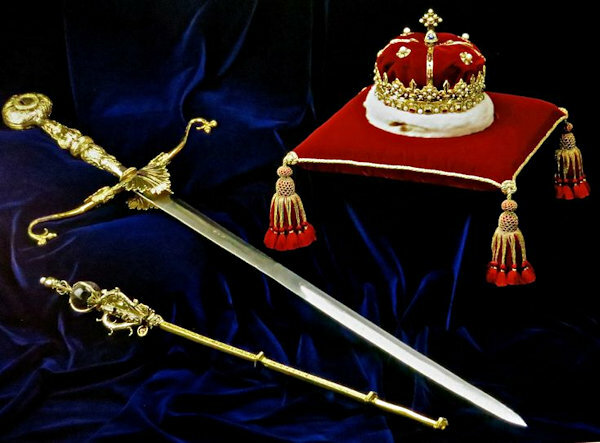 The Honours consist of the Sceptre, which was sent to James IV by Pope Alexander VI in the 1490s, the Sword, given to James IV by Pope Julius II in 1507 and the Crown. The Crown was remade from the earlier one in 1540. These have a Dunnett connection - Dorothy once needed to paint them for a portrait she had been commisioned to produce of the actor Duncan Macrae in character as King James VI. However it was impossible to make sketches during the day when the tourists were milling around them and they are locked securely in their strongroom outwith visiting hours. The only thing to be done was for Dorothy to get permission to be locked in wth them overnight! This was duly done and you can see the resultant portrait which now hangs in a Glasgow Museum. 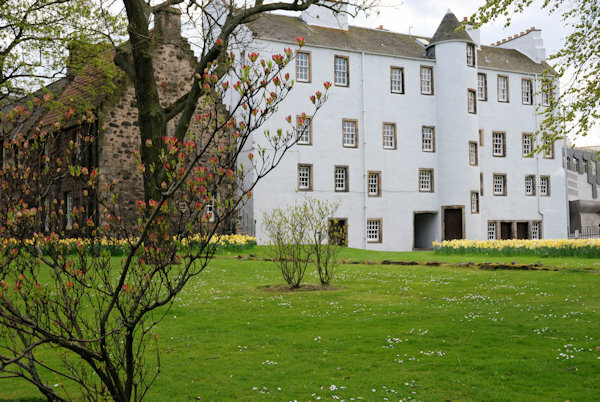 Also within the castle are the apartments where Mary Queen of Scots gave birth to her son, who became James VI of Scotland and, on Elizabeth's death, James I of England. Mons Meg is a muzzle-loaded bombard which weighs over 6 tons and fired stones weighing over 150kg a distance of nearly 3km, but could only be fired about 8 times a day because of the enormous amount of heat generated. The National War Memorial, of which Dorothy was a Trustee, is situated within the castle. If you happen to be near the battlements around 1pm you'll be able to see and hear the famous One O'Clock Gun, which is fired at that time every day as a time signal. In front of the castle is the Esplanade, which of course is where the Edinburgh Military Tatto takes place during the Edinburgh Festival. 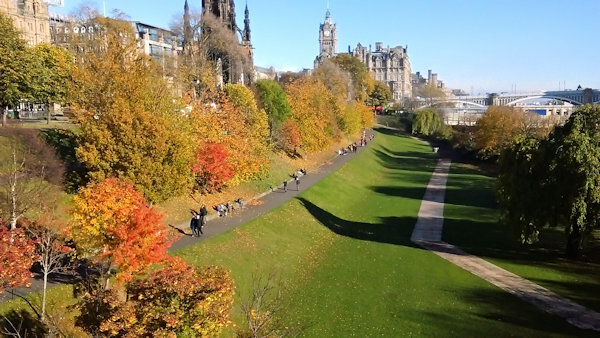 When leaving the Esplanade I recommend visiting the Camera Obscura in the Outlook Tower - no Dunnett connection but I worked there as a tourist guide over 40 years ago! The tower was originally set up by Sir Patrick Geddes (1854-1932), who was a pioneering town planner, as well as a biologist, sociologist, and geographer. The North side of the Lawnmarket is the area where Dorothy put Sybilla's townhouse and before that Nicholas' earlier building. Slightly further up the hill was where the Queen Mother's apartments were situated. Those areas are now taken up by New College - the Theology Dept of Edinburgh University - and the Church of Scotland's Assembly building, along with Mylne's Court, which was an early example of student accommodation and still houses the theology students. Just below Gladstones Land is the entrance to Lady Stair's Close, in which is situated Makar's Court and the Writer's Museum. Just outside the museum's entrance is the stone commemorating Dorothy, which the Dunnett Society arranged to be installed a few years ago, joining many other famous Scots literary figures. The museum periodically exhibits some items of Dorothy's including the Unicorn Order Necklace which was presented to her in commemoration of her research work on Anselm Adorne, and the gold, silver and wooden warming apple which was given to her by readers. 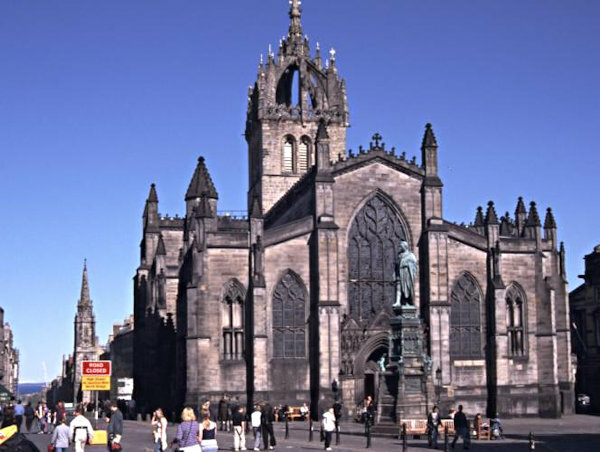 Sometimes incorrectly called St Giles Cathedral it is of course the scene of the dramatic confrontation and swordfight between Lymond and Graham Reid Mallett at the end of Disorderly Knights. There has been a church on the site since 854, the four central pillars dating from around 1120. The massive crown steeple dates from 1495, though the present form of the building is much more recent at 1829. Having been changed so much over the years the layout is not the same as it was in Lymond's time, so you cannot exactly match the scenes described to the current floor plan. The Lauder Aisle (where Lymond takes his vow) is to the right as you enter the kirk, but the area is now panelled off, while straight ahead is the main altar. In my youth the Kirk was quite plain, but in recent years it has been much restored and cleaned, superb new lighting installed, and the organ restored and upgraded. 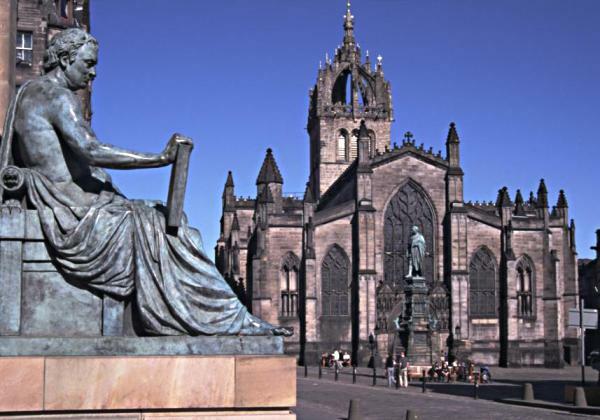 St Giles was a Greek hermit who was the patron saint of beggars and criminals!! These old passageways and wynds are fascinating and contain a great deal of history. Unfortunately, of the closes mentioned in the Chronicles, Gosford Close no longer exists and Bruce's Close was absorbed into Warriston Close. Chalmers Close, just up the hill from John Knox's House, contains what remains of Trinity College Church where Nicholas sings a motet. 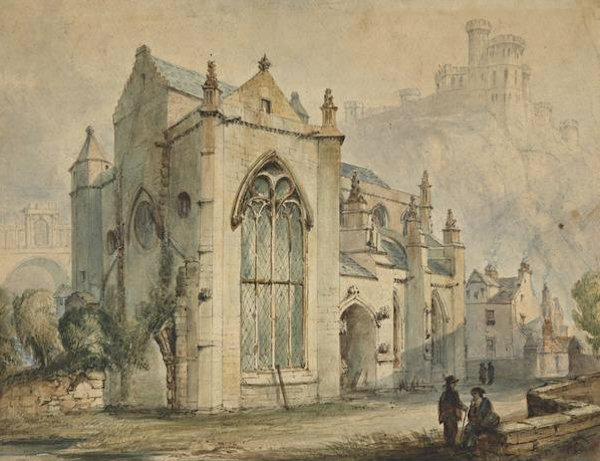 Originally a very fine piece of gothic architecture, it previously stood where Waverly Railway Station is now but was taken down in 1848 when the station was constructed and the stones numbered so that it could be rebuilt. Unfortunately many of the stones were stolen and as a result only the apse could be recreated in the close. It now houses the Brass Rubbing Centre. 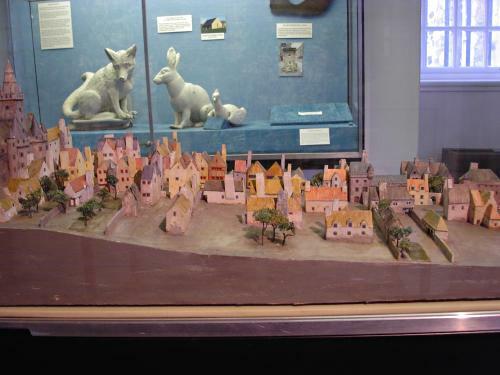 Just beyond John Knox's House sits the Netherbow Arts Centre, which takes its name from the Netherbow - the eastern gate into Edinburgh when the city was surrounded by a wall, as it was in Lymond's time. The wall was known as the Flodden Wall, after the disastrous battle in which James IV was killed, and only small fragments of it remain. The Netherbow was roughly where the junction of Jeffrey Street and St Mary's St meet the HIgh Street and beyond that we are into the Canongate. It was around this area that Elspeth Morrison believed that Nicholas had his house and offices when implementing his Scottish Plan. Further down the Canongate on the right there is St. John's Pend - named after the Knights of St. John who had their house here. The Priory of the Most Venerable Order of St. John still stands in St. John's Street behind the building facing the main street and displays the Maltese Cross above its door. There is another large one painted on the roadway just above Old Playhouse Close which you will have just passed. There are many more interesting nooks and crannies to be found for those interested in more general history, and plenty of guides - both human and printed - to their stories. Continuing down you will see the Old Tollbooth on the left, which now houses an exhibit called the People's Story. A few yards further on the right is the Museum of Edinburgh, which is well worth exploring both for its unusual architecture, and the exhibits which include some of the original wooden water pipes used in the city and a two-part model of the Royal Mile around the time that our books are set; showing how each house had gardens and orchards behind them. 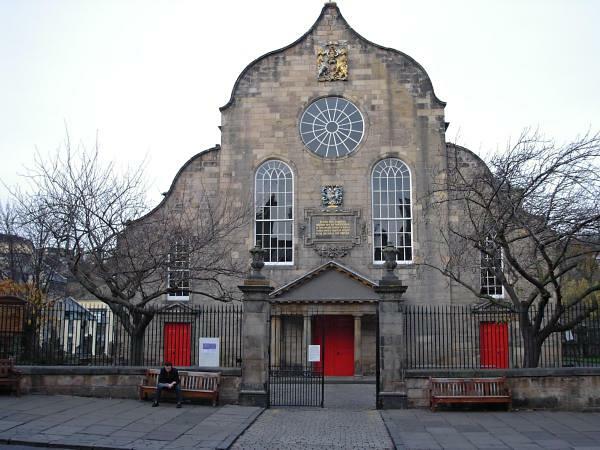 Opposite the museum on the north side is the Canongate Kirk. It was here that the funerals of both Alastair and Dorothy were conducted by their old friend Rev Charles Robertson, who was chaplain to the Queen and was the subject of one of Dorothy's last major portraits. I am fortunate that my father is also a friend of Charlie Robertson, since his branch of the Normandy Veterans Association held their ceremonies at the Kirk and their standard now hangs there. I was able to visit Charlie and his wife at the Canongate Manse before he retired as its minister and as well as spending a lovely evening remembering Dorothy, he also gifted me the Coia portrait of her which still takes pride of place in my living room. 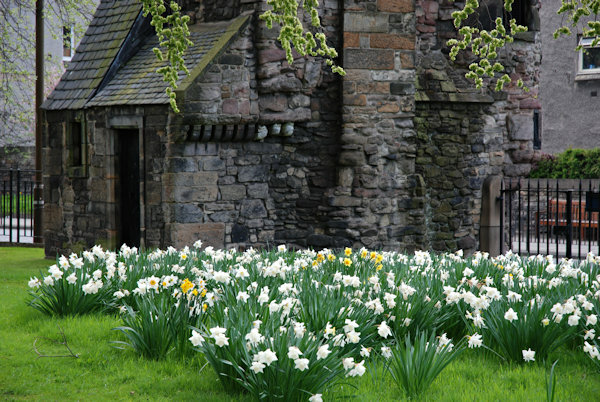 Not really mentioned much in the books but a major attraction and so closely connected to the Scottish crown and Mary that it's not to be missed. 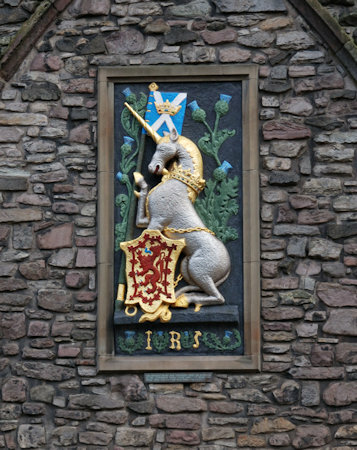 Situated at the bottom of the Royal Mile at the edge of Holyrood Park, it was started by James IV in 1501 and is today the official residence of the Queen. 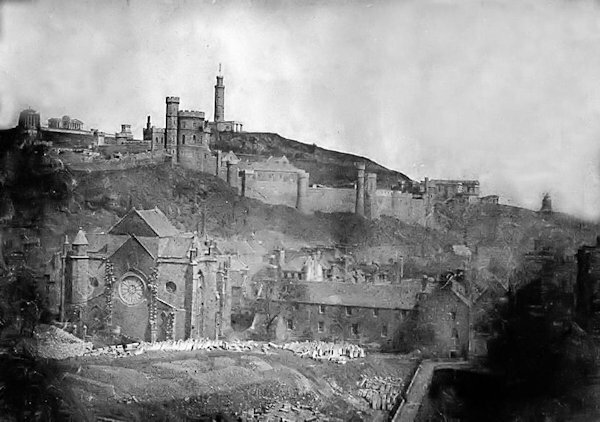 The ruins of Holyrood Abbey adjoin the palace - the Abbots of Holyrood owned much of the land around Edinburgh that is mentioned in House of Niccolo, and it was near the Abbey that Nicholas staged his spectacular play. The Abbey was destroyed by the Earl of Hertford in 1544 during the Rough Wooing. The last person to be buried there was Darnley - the same Henry Lord Darnley that we meet in the Chronicles as the young son of Margaret Lennox.